Woman Arrested for Alleged Abuse of 7 Year Old Girl, LIVINGSTON, April 29, 2016 - April 20, 2016, Polk County Sheriff’s Office detectives responded to a local elementary school concerning suspicious allegations of the physical abuse of a 7 year old female child. During investigation detectives determined the child’s body contained severe bruising concealed by clothing. After consulting with the District Attorney’s office, the child was taken to Childrenz Haven where a child forensic interview was conducted. Detectives further gained knowledge of the child being physically abused by a girlfriend of the child’s father. The forensic interview revealed details and a timeline from the child of how her father’s girlfriend spanked, choked and held her hand over the child’s mouth blocking the child from breathing. 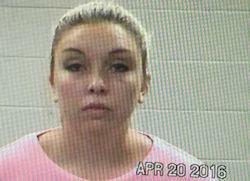 Detectives later questioned Sierra Star York who admitted to spanking the child after getting home from Wal-Mart. She says the child was acting up and not obeying. Sierra York was arrested for the offense of Assault Fam/House Member Impede Breath which is a 3rd degree felony. Additional criminal charges are pending at this time. Bond was placed at $10,000 by JP 3 Larry Whitworth. Sheriff Hammack ask if you know or you suspect any child being abused physically and or sexually to contact Lt. Craig Finegan or Det. Christi Allen with the Polk County Sheriff’s Office at 936-327-6810.